You will learn how PV systems work. Identify and discuss four types, components, applications, and limitations of each system type. Define the solar window, energy efficiency recommendations, and estimate system loads. Kris Schmid is the founder and owner of Legacy Solar – a solar energy company outside of Frederic, WI. His company provides education, consultation, design, and installation of solar electric and solar water heating systems. Legacy Solar has been providing clean energy solutions to northwestern Wisconsin since 2002. 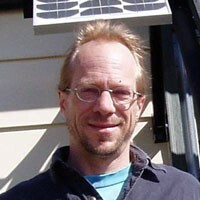 Kris came to the solar energy field from a career in electrical engineering.